Our Virginia Beach Veterinarian can control your pet's flea and tick problem. When a pet struggles with fleas or ticks, the whole family struggles. At Birdneck Animal Hospital in Virginia Beach, we understand what a struggle it can be when a pet becomes infested with fleas or ticks. It can spread quickly to other areas of the house and cause a pet a great amount of discomfort that often leads to misbehaving. Many treatments of flea and tick problems do not last long or prevent the return of the parasites. 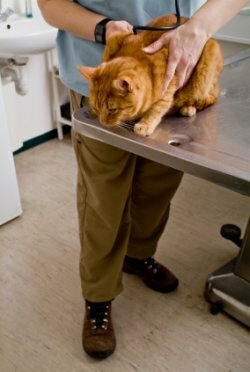 Our veterinarian in Virginia Beach focuses on not only the treatment of parasite infestations but also the prevention. Treatments at our veterinary clinic help pets avoid the suffering and annoyance of constant flea and tick infestations. In addition to providing treatments for fleas and ticks, the veterinarians at our animal clinic also offer vaccinations, dental care, boarding and surgery for pets. Although it can be obvious once the problem escalates, there are several different ways to tell if a pet has fleas in the early stages. Our animal clinic advises that you check your pet's coat regularly to look for any dark specks. Fleas are so small that it may be difficult to distinguish between a community of fleas or dirt leftover from playing outside. The best way to tell is to collect some on a damp paper towel and rub it all around. If the paper has an orange-colored streak, this is an indication of fleas. Fleas and ticks are common problems in both indoor and outdoor pets. The veterinarian at our animal hospital can show pet owners how to administer the medication properly to kill fleas and ticks and prevent them from coming back. It can often be difficult to tell which treatment and prevention formulas available are effective. The professionals at our Virginia Beach animal hospital have the experience and knowledge to advise patients about what flea and tick products are effective and best suited for your pet. Not only will the staff at our veterinary clinic be able to find an effective treatment formula for pets, but we will also teach pet owners how to apply properly the medication. Improper application is often one of the main reasons flea and tick formulas are ineffective. Our Virginia Beach animal hospital believes that treatment formulas should be complemented by prevention formulas as well, so when the fleas and ticks are gone, they do not return. Although all pets can be exposed to problems with parasite infestations, outdoor pets tend to suffer from infestations more often than indoor pets. Our veterinary clinic advises owners to prevent infestations by keeping pets away from animals that can carry parasites such as raccoons, opossums and from environments that may be homes for these parasites. Owners should try to limit a pet's exposure to these parasite sources at all times as a form of prevention. This is especially important because these animals can often carry harmful diseases that can affect a pet, even if the pet has had proper vaccinations. If you believe your pet has parasites, please contact our veterinary hospital immediately for treatment. The sooner fleas and ticks are targeted and treated at our animal clinic, the better it is for both you and your pet. In addition to these services, the veterinarian at our veterinary hospital also provides dental care, boarding and surgery. You can reach our veterinary clinic by phone at 757-355-5694 or by email.